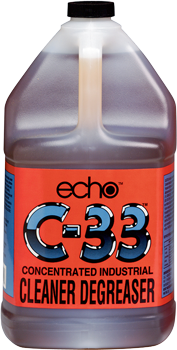 Echo C-33™ is a highly concentrated product made for the most difficult degreasing and cleaning. Its nonflammable, water-soluble properties provide an outstanding cleaner for the tough jobs around the plant and shop. 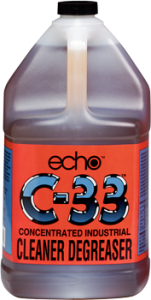 When used as directed, C-33™ will not harm metal or stainless steel, and is ideal for use in automatic scrubbers. 1. Mix with water depending on dirt – grease concentration 32 to 1 or 8 to 1. 2. Can be used full strength on nonpainted surfaces. 3. Apply to surface to be cleaned. Let sit 5 to 20 minutes.